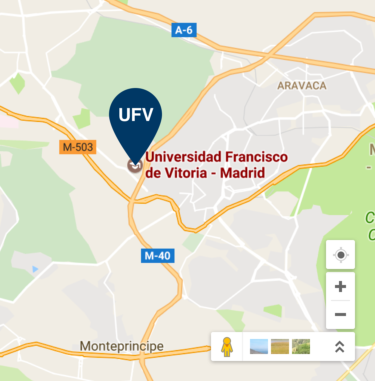 Universidad Francisco de Vitoria (UFV) is a private, non-profit Catholic university located in metropolitan Madrid, Spain. 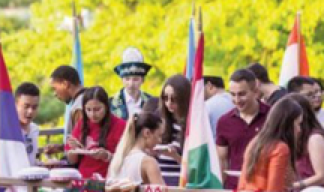 Founded in 1993, it has since become a fastgrowing institution of higher education with a student body of over 6500 undergraduate students and 6000 postgraduate students. Today the campus houses six faculties, including a prestigious school of Culinary Arts (Le Cordon Bleu), a Vocational Training Center (CETYS), a Postgraduate Studies Center, an Executive Consulting and Coaching Center (IDDI), an International Business School and a Medical Simulation Center, which collectively cover the full spectrum of training, research and education. WHO WAS FRANCISCO DE VITORIA? recovered, since he always preferred teaching to publishing. His lectures bear witness to the Christian humanism that inspired him, his cultural wealth and his extraordinary teaching capacity. They reveal a deep and precise thinker, a man immersed in the problems surrounding him. He is considered the founder of international law. attitudes in order to become a great profesional in tomorrow’s world. In this undertaking, the lecturers play a fundamental role, as a large part of the students’ educational experience will depend on the Faculty members that accompany them throughout their studies. At UFV, they will be able to count on excellent lecturers, many of them active professionals who teach them how to get the most out of every subject taught and even open the door to the professional world. All lecturers provide an hour of tutoring for every three hours of class and are available in their offices to meet the needs of the students. Every student has a mentor who will accompany and advise them throughout the first year of their studies. Through mentoring, the lecturer will observe the student’s evolution and will strive to bring out their very best. The theoretical content taught in class is complemented with dynamic work placements which train the students in the skills and competences specific to the degree course. Practical classes, group dynamics, the virtual classroom and installations prepared so that they may apply what has been learned from the very first day of class (television and radio studios, dissection rooms for Medicine, bone museum, Biotechnology labs, projection rooms, debating salas, computing and digital manipulation labs...). An ambitious programme of obligatory practice sessions that ensure that a great percentage of our students receive an offer of employment in the very same places they are carrying out their work placements. In order to be a great professional, it is vital that the student is fully aware of the values inherent to the profession and the meaning of the work to be undertaken. In addition, at UFV they learn to put themselves to the service of others through their professional activity. Humanistic classes applied to every one of our degree courses. Seminaries and leadership workshops that enhance key competences and develop the students’ critical thinking skills. The students help others, find meaning in their profession and are the driving force through the subject Education for social responsibility. UFV is a social, Catholic non-profit foundation which reinvests its profits in the training and education of its students and in the constant improvement of its facilities and installations. We include English classes in all our degree study plans. Moreover, our Language Centre offers clases in French, German and Italian, among others. UFV has agreements with more than 1,700 companies, thanks to which our students obtain employment more easily after completing their studies. Moreover, by means of an ambitious obligatory work placement programme, they also gain practical experience in work related to their degree course, with 80% receiving a job offer or a work placement renewal offer from the very same company they are working in.